Click here to see an infographic, showing the impact of portion size, and how policies could be developed in response. Given that larger portions are now an established part of the highly competitive food market, change will require active intervention. The abundance of large portion sizes reflects a synergy of public demand with commercial interests; buyers want filling portions at competitive prices—particularly of highly palatable, usually energy dense foods—and industry benefits from cost savings when supplying and packaging larger portions combined with promotional strategies to increase producers’ market share. There has been little research on interventions to reduce portion size and existing studies have shown mixed effects.11 It seems likely, however, that effective interventions will reduce demand and supply, setting up a virtuous circle, to recalibrate portion sizes. Achieving such change will require support from the public, industry, and politicians. We consider what interventions might work, where and how they can be made, and who needs to act (fig 2⇓). The box shows interventions with the potential to reduce portion sizes. Interventions in physical environments include reducing the availability of larger sizes for energy dense foods and drinks and the tableware used for their consumption, designing packaging to demarcate single portion sizes, and limiting portion sizes used in advertisements. Price is cited by shoppers as a major influence on product choice.17 This makes foods and drinks in larger portions and packages more appealing because they often cost less in relative (and sometimes absolute) terms. However, restrictions on such pricing practices may be limited by differences in the true cost of production and Competition Commission rules. Most of the existing evidence on the effects of reducing portion size comes from studies of very large portions. We therefore cannot be certain that reducing smaller portions would be as effective in reducing food consumption. Where can these interventions be made? Interventions in commercial environments pose major challenges. For example, the attempt to introduce a 16 ounce (454 mL) limit on the size of sugar sweetened beverages sold in food outlets in New York City met with much resistance and has been unsuccessful.26 There has been an effort to reduce portion size in England through voluntary agreements as part of the Public Health Responsibility Deal. For example, Mars, Nestlé, and Mondelez, the three largest chocolate manufacturers have committed to limiting the energy content of single serve confectionery to 250 kcal. However, broader change across companies and products is fragmented, and there has been no evaluation of the net reduction in energy intake as a consequence of portion size reductions. Some cinema chains in England have voluntarily removed their largest cup size of soft drinks so that the maximum is now 32 ounces, but this is still a large amount and the fact that not all cinemas have signed up illustrates the limits of a voluntary approach. How can these interventions be achieved? Effective interventions will also need to take into account industry innovations that may circumvent the intended effects of policy approaches. For example, the agreement of confectionery manufacturers to phase out king size chocolate bars in 2005 led to the introduction of bars containing multiple portions, ostensibly for sharing or consuming at different times. A 2015 poll reported that 40% of those aged under 25 regularly eat a whole 150 g “sharing bag” of crisps, which can contain up to a third of an adult’s recommended daily intake of calories and salt and almost a quarter of the recommended intake of fat.30 Conversely, very small portions may also increase consumption if they encourage non-consumers to try the product or if small individual units are offered in bulk quantities that may increase frequency of consumption. While public acceptance seems necessary for governments and the private sector to act, real progress may require more coordinated public demand.35 The introduction of many tobacco control measures reflects the mobilisation of public support, not yet evident for obesity control.36 Strategies that inform and enable communities could increase their demand for change to tackle obesity. Providing information about the effectiveness of interventions increases support for them.37 38 Communities can also be enabled to act through stronger non-governmental organisations (NGOs) as seen in Mexico where, through Bloomberg Philanthropies, NGOs purchased prominent advertising space to effectively counter industry opposition to soda taxes. The compelling evidence that larger portion sizes of food and non-alcoholic drinks increase consumption is currently unmatched by similarly strong evidence on how to reduce this effect. This requires independent and rigorous evaluation of interventions that aim to reduce the size, availability, and appeal of larger portions. Successful interventions, if implemented at sufficient scale, have the potential to help prevent obesity as part of a wider obesity strategy.27 Aligning the will of the public, private industry, and political leadership is key to progress. Contributors and sources: This article was prompted by the completion of our Cochrane review4 and the desire to draw out the policy implications of this and other cognate studies. TMM and GJH have expertise in behaviour and behaviour change, GJH and IDS have expertise in evidence synthesis, SAJ has expertise in nutrition and public policy to change diet. TMM is the guarantor of the article. Competing interests: We have read and understood BMJ policy on declaration of interests and declare SAJ is the independent chair of the Public Health Responsibility Deal Food Network in England. The Behaviour and Health Research Unit is part funded by the UK Department of Health policy research programme (PR-UN-0409-10109). The Department of Health had no role in the preparation of this manuscript. The views expressed are the authors and not necessarily those of the funders. Ng M, Fleming T, Robinson M, et al. Global, regional, and national prevalence of overweight and obesity in children and adults during 1980-2013: a systematic analysis for the Global Burden of Disease Study 2013. Lancet2014;384:766-81. World Health Organization. Interim report of the Commission on Ending Childhood Obesity. WHO, 2015:1-30. World Health Organization. Follow-up to the political declaration of the high-level meeting of the general assembly on the prevention and control of non-communicable diseases the sixty-sixth World Health Assembly. WHO, 2013:1-55. Hollands G, Shemilt I, Marteau T, et al. 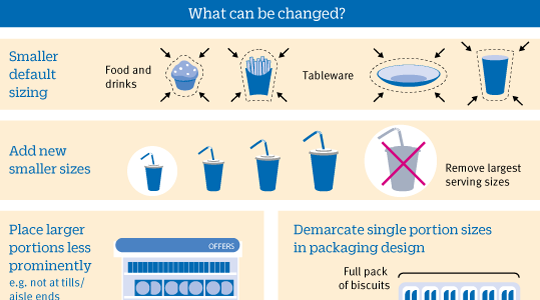 Portion, package or tableware size for changing selection and consumption of food, alcohol and tobacco. Cochrane Database Syst Rev2015;9:CD011045. Zlatevska N, Dubelaar C, Holden SS. Sizing up the effect of portion size on consumption: a meta-analytic review. J Marketing2014;78:140-54. Clift J. Portion distortion: how much are we really eating? British Heart Foundation, 2013:22. NICE. Maintaining a healthy weight and preventing excess weight gain among adults and children. NICE guideline 7. 2015. www.nice.org.uk/guidance/ng7. WHO. European food and nutrition action plan 2015-2020. WHO Europe, 2014. Dobbs R, Sawers C, Thompson F, et al. Overcoming obesity: an initial economic analysis. McKinsey Global Institute, 2014. Benton D. Portion size: what we know and what we need to know. Crit Rev Food Sci Nutr2015;55:988-1004. Steenhuis I, Vermeer W. Portion size: review and framework for interventions. Int J Behav Nutr Phys Act2009;6:1-58. Diliberti N, Bordi PL, Conklin MT, et al. Increased portion size leads to increased energy intake in a restaurant meal. Obes Res2004;12:562-8. Cavanagh K, Vartanian LR, Herman CP, et al. The effect of portion size on food intake is robust to brief education and mindfulness exercises. J Health Psychol2014;19:730-9. Spanos S, Kenda AS, Vartanian LR. Can serving-size labels reduce the portion-size effect? A pilot study. Eat Behav2015;16:40-2. Versluis I, Papies EK, Marchiori D. Preventing the pack size effect: exploring the effectiveness of pictorial and non-pictorial serving size recommendations. Appetite2015;87:116-26. Hollands GJ, Shemilt I, Marteau TM, et al. Altering micro-environments to change population health behaviour: towards an evidence base for choice architecture interventions. BMC Public Health2013;13:1218. Department for Environment Food and Rural Affairs. Food statistics pocketbook . 2014. Defra, 2014. Surgeon General. The health consequences of smoking—50 years of progress. Atlanta, US Department of Health and Human Services, 2014. World Health Organization. Evidence for the effectiveness and cost-effectiveness of interventions to reduce alcohol-related harm. WHO, 2009. Knai C, Petticrew M, Durand MA, et al. Has a public-private partnership resulted in action on healthier diets in England? An analysis of the Public Health Responsibility Deal food pledges. Food Policy2015;54:1-10. Eight everyday products that are getting smaller: shrinking goods include Surf, Cif and Hovis bread. Which? 2015 Mar. www.which.co.uk/news/2015/03/eight-everyday-products-that-are-getting-smaller-396942/. Hawkes C, Smith TG, Jewell J, et al. Smart food policies for obesity prevention. Lancet2015;385:2410-21. Lewis HB, Ahern AL, Solis-Trapala I, et al. Effect of reducing portion size at a compulsory meal on later energy intake, gut hormones, and appetite in overweight adults. Obesity2015;23:1362-70. Sahud HB, Binns HJ, Meadow WL, et al. Marketing fast food: impact of fast food restaurants in children’s hospitals. Pediatrics2006;118:2290-7. Bonfield P. A plan for public procurement: enabling a healthy future for our people, farmers and food producers. Department for Environment, Food, and Rural Affairs, 2014. Pomeranz JL, Brownell KD. Can government regulate portion sizes? N Engl J Med2014;371:1956-8. Rutter H. The single most important intervention to tackle obesity. Int J Public Health2012;57:657-8. House of Lords Science and Technology Committee. Behaviour change: 2nd report of session 2010-12. 2011. www.publications.parliament.uk/pa/ld201012/ldselect/ldsctech/179/179.pdf. Bryden A, Petticrew M, Mays N, et al. 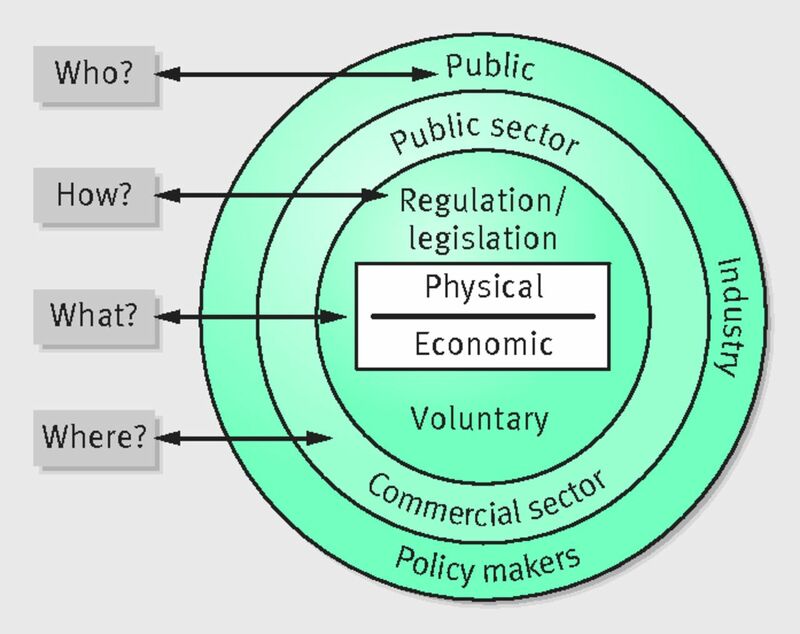 Voluntary agreements between government and business—a scoping review of the literature with specific reference to the Public Health Responsibility Deal. Health Policy2013;110:186-97. Brown N. Revealed: 40% of young binge on crisps and 75% skip meals. Grocer2015 Jan 30. www.thegrocer.co.uk/reports/digital-features/snack-report-2015/revealed-40-of-young-binge-on-crisps-and-75-skip-meals/512721.article. Swinburn B, Kraak V, Rutter H, et al. Strengthening of accountability systems to create healthy food environments and reduce global obesity. Lancet2015;385:2534-45. Diepeveen S, Ling T, Suhrcke M, et al. Public acceptability of government intervention to change health-related behaviours: a systematic review and narrative synthesis. BMC Public Health2013;13:756. The New York Times’s public opinion poll. New York Times2012 Aug 21. www.nytimes.com/interactive/2012/08/22/nyregion/22nyc-poll.html?_r=0. Schwartz J, Riis J, Elbel B, et al. Inviting consumers to downsize fast-food portions significantly reduces calorie consumption. Health Aff (Millwood)2012;31:399-407. Huang TT, Cawley JH, Ashe M, et al. Mobilisation of public support for policy actions to prevent obesity. Lancet2015;385:2422-31. Freudenberg N. Lethal but legal: corporations, consumption, and protecting public health. Oxford University Press, 2014. Promberger M, Dolan P, Marteau TM. “Pay them if it works”: discrete choice experiments on the acceptability of financial incentives to change health related behaviour. Soc Sci Med2012;75:2509-14. Pechey R, Burge P, Mentzakis E, et al. Public acceptability of population-level interventions to reduce alcohol consumption: a discrete choice experiment. Soc Sci Med2014;113:104-9.